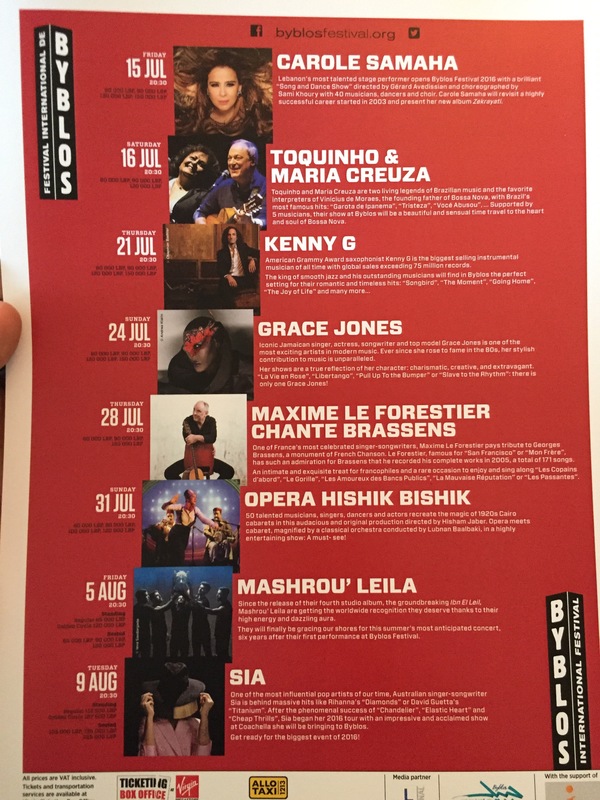 A source of mine just sent me the line-up of this summer’s Byblos Festival, in an otherwise very quiet lead up. This same time last year, the festival had already confirmed John Legend and I had leaked Alt-J performing. Many had thought the festival was out of big names for this summer, but it seems we’ve all been wrong. Sia, the Australian super star behind songs such as Chandelier and Titanium, will be performing on August 9th. No words yet on whether she will show her face, but her voice will more than suffice either way. This will be Sia’s first performance in the entire Middle East. It will be a recreation of her critically acclaimed showcase at Coachella. In a surprisingly disappointing line-up, Sia seems to be the main draw when it comes to international talent. Other acts that will also be in the festival are Mashrou’ Leila, Hishik Bishik and Carole Samaha as Lebanese performers and renowned saxophonist Kenny G as well as Grace Jones. Sitting: $70, $90 and $150. Your prayers have been answered, indie music Lebanese fans, for this year’s concerts are no longer just about the music you run away from. Rejoice! Since you, my dearest readers, deserve a bit of happy news every now and then on here, I am leaking your way some major information that was shared my way. Yes, the Byblos Festival will be more than John Legend and The Script. Yes, you don’t need to keep worrying that it’s just too *mainstream* this year. British band Alt-J will be coming to Lebanon for a concert this summer! It’s confirmed. The date will be announced soon. So for those who were in a state of panic, you can now relax (and get your money ready) because I’m sure this leak will brighten your day. 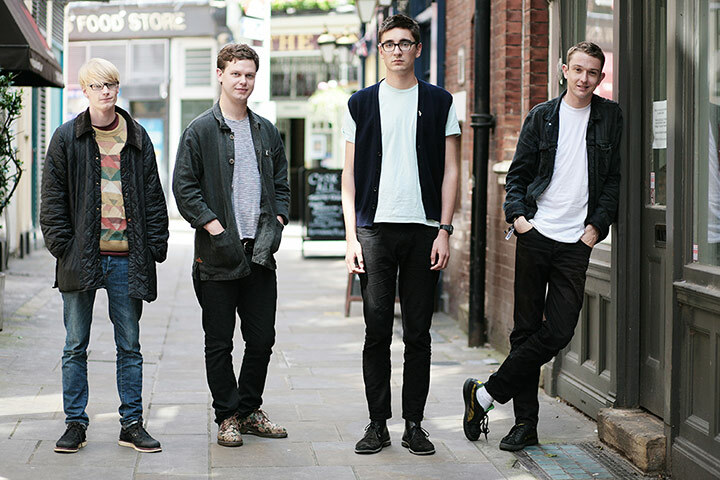 For those who don’t know them, Alt-J rose to prominence in 2012 with the album “An Awesome Wave.” Their latest offering, This Is All Yours, released in 2014, managed to top the UK albums chart. Their most famous song worldwide is “Tessellate,” which was covered by Ellie Goulding later on. One thing to be said about all of this is kudos to the Byblos Festival for bringing high-profile talents to Lebanon year after year. Along with Alt-J, they are bringing John Legend who had the past year’s biggest hits in “All Of Me” as well as materializing a concert by “The Script” who were long-rumored to be coming. In making sure that it is always of international caliber, Byblos Festival has consistently been a highlight of every summer we’ve had in Lebanon. And with all of this to the backdrop of arguably the country’s most touristic city, Jbeil, it becomes something you can’t not be proud of. My hat goes off to all the effort that goes into making this successful and news-worthy every single year. According to Frodo’s Blog who has been actively leaking major performers throughout the past several months, the rumors about Lana Del Rey coming to the Byblos festival this year are true. The singer who’s famous for her melodramatic songs will be coming to Lebanon as part of the aforementioned festival for a concert on July 10th, beyond her showing up for the opening of Skybar on May 30th. I’m not a fan of Lana Del Rey but I’m actually surprised the organizers of any festival in Lebanon were able to draw in such a currently “in” name to come perform here. I expect this to be the most hyped concert of the summer, if no other surprises happen. You can check out ALL of the lineup for the Byblos Festival here. Posted on April 16, 2013 by eliefares Tagged ConcertLebanonmusicRihanna	Comments8 Comments on Is Rihanna Coming to Lebanon for a Concert? Is Rihanna Coming to Lebanon for a Concert? 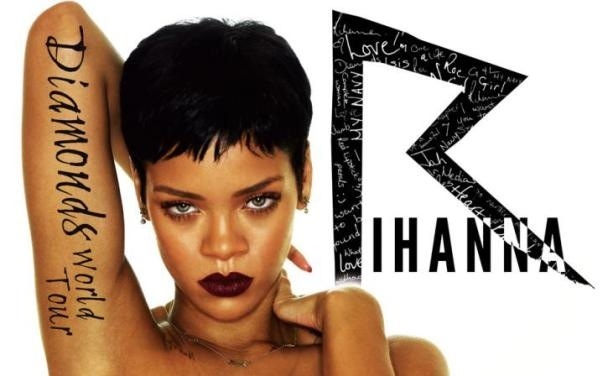 Rihanna might be coming to Lebanon for a concert this summer. Such prospects would make this the event of the summer. Sorry The Script. Has Lebanon ever had someone as currently popular as Rihanna come for a concert in recent times? However, for the same reasons it’s improbable for bands such as Coldplay or Muse to hold concerts in Lebanon, does it even make sense for her to come here? Would an artist who’s used to international sell-out tours that fill stadiums and bring millions of dollars in revenue come to a country where venues such as “Stade de France” do not exist and where, despite potentially inflated ticket prices, profit wouldn’t be substantial and long-term fan base building basically irrelevant? Either way, if there’s any truth to this, prepare for an onslaught of Rihanna songs on the radio – worse than what we currently have – and people gushing over how important Lebanon has become. I, for one, don’t think there’s much to it though. Posted on April 14, 2013 by eliefares Tagged ConcertLebanonThe Script	Comments3 Comments on The Script Coming to Lebanon This Summer? 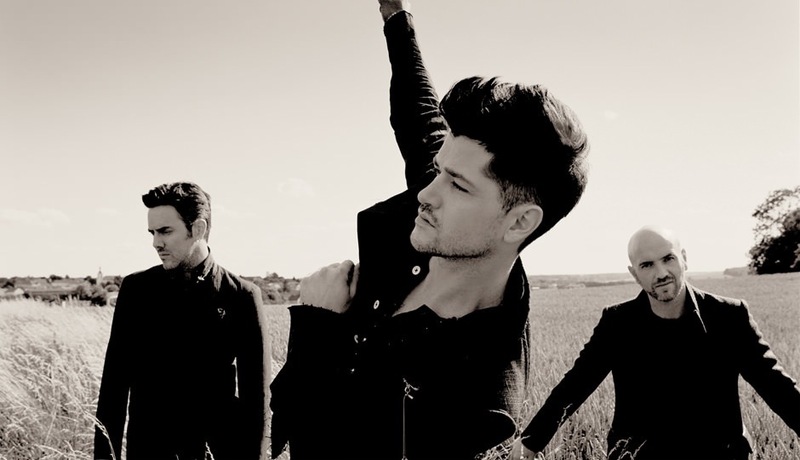 The Script Coming to Lebanon This Summer? “The Script” Lebanese fans on twitter have been busy trending #TheScriptToLebanon for the past few hours. Soon enough, Twitter will show it trending as part of Lebanon’s regional “worldwide” trend and they’ll be satisfied. But there’s actually more to it than a Twitter trend out of nowhere. A trusted source has recently informed me that a local productions agency – I won’t reveal its name, just in case – is in talks to bring Irish band The Script for a summer concert in Lebanon. Things are definitely not set in stone yet but the prospects are serious enough for some tidbits to actually leak: The Script are heavily considered to be this summer’s “it” band performing in the country. Of course, given how things go around here, plans could fall through at any given moment given how preliminary they are at this point. But Lebanese Script fans, rejoice, your favorite band may be meeting you soon enough. 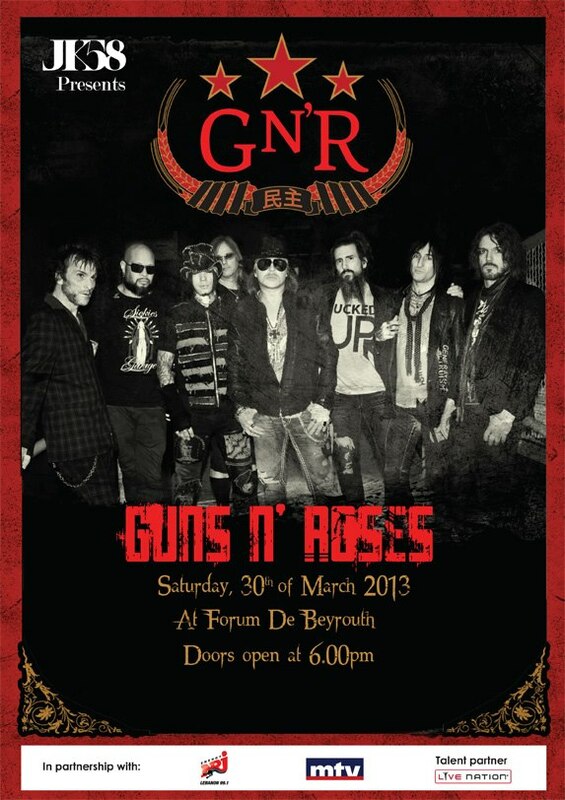 You all know that one of the world’s best rock groups is coming to Lebanon. Well, I’ve got some extra details for the concerts that you might be interested in. Ticket prices: General Admission: 55$ or 82,500 LBP, zone A and B (Green): 100$ or 150,000 LBP, zone A (Blue): 120$ or 180,000 LBP, golden Circle: 150$ or 225,000 LBP, zone A and B (Pink): 200$ or 300,000 LB, lounge Access: 200$ or 300,000 LBP. Bande’s lineup: Axl Rose, Dizzy Reed, Chris Pitman, Frank Ferrer, Richard Fortus, Tommy Stinson, Ron Thal, DJ Ashba. A presale for those of you who are very interested is currently available through this website (click). You can call 70488170 or e-mail them on Info@Presella.com. You can now buy the tickets from Virgin by clicking on this link. This is the link for the Facebook event. Thank you Frodo’s blog (link) for the info. But I’m actually baffled by the reaction of some of the people attending. There’s a limit to how much crap you can take from an artist. He was 90 minutes late, the event’s organization was a royal mess – and yet because he’s Ziad, no one is allowed to complain? Spare me the hipstery all-hail-to-Ziad attitude. I am not a Ziad el Rahbani fan and after the above video, I will never be. I will never listen to his plays nor will I quote his useless lines nor will I be taken by his music. There are plenty of much better musicians out there that he can only dream of approaching that I’d rather listen to. What can I make out of an artist that doesn’t respect his fanbase enough to even apologize for wasting over an hour and a half of their time while they sat and waited for him and then has the decency to actually call them out for speaking up? That’s not an artist I can respect. What do you make out of an artist that treats the people who were pissed because he was late so callously and is met by applause from an audience who stood by him, non-caring about the time of their life that was wasted? The sad part is his “fans” believe that people don’t have the right to complain because Ziad is sharing their art with them. They actually think the people complaining are doing so because they’re bothered by his success – as if they would have bothered snatching up those rare and pricey tickets in the first place if the only thing they wanted to do was cause a riot at the concert. In any decent country, this delay would have warranted a refund. Except in Ziad el Rahbani land, an artist that wants your money and wants to insult you for wanting to get your money’s worth. 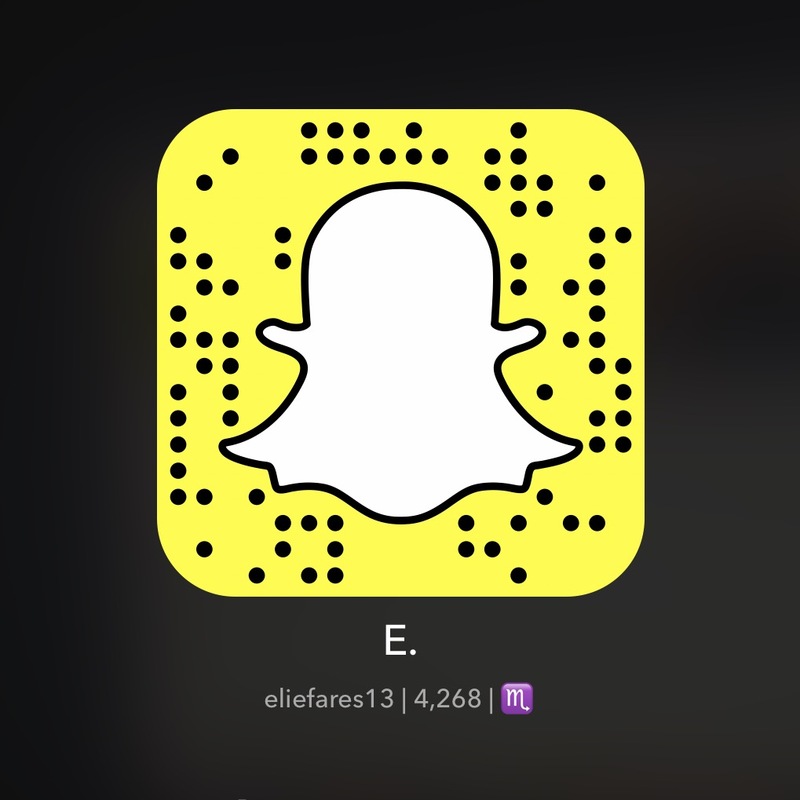 “Iza mannak mabsout, 3a shou ba3dak hon?” Ye2ta3 habal l 3alam yalli mfakkrin enno heik shi ma2boul.